To provide students with the education they need to thrive in a globally connected world, we must find ways to design, fund, acquire, and maintain the infrastructure that will make connectivity a reality for every teacher and student in every learning environment. 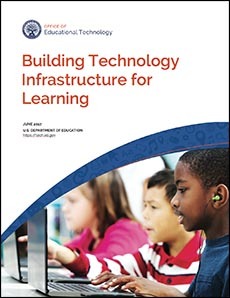 This K-12 school infrastructure guide provides practical, actionable information to help school and district leaders (including superintendents, principals, and senior technology staff) navigate the many decisions required to build a technology infrastructure that supports digital learning. The guide presents a range of options for school and district leaders to consider when making technology infrastructure decisions. Quick Reference Guide of Key Questions for Planning Technology Infrastructure: This quick reference guide includes questions for school and district leaders to consider when planning a technology infrastructure that supports digital learning. Articulates a vision of equity, active use, and collaborative leadership to make everywhere, all-the-time learning possible. Technology funding available for state and district leaders.